The C.H.I.C.K Program® (Ceva Hatchery Immunisation Control Keys), is a global service program implemented in more than 40 different countries which involves Ceva’s specialist teams visiting the customer’s hatcheries. What is the C.H.I.C.K. Program®? The C.H.I.C.K Program® (Ceva Hatchery Immunisation Control Keys), is a global service program implemented in more than 40 different countries which involves Ceva’s specialist teams visiting the customer’s hatcheries to run a number of tests to check the quality of the administration of vaccines. We check whether the vaccines are properly stored, prepared and administered to the birds. This program received Quality Recognition by the certification and control body Bureau Veritas Group in 2016. This is a notable first for the animal health industry. We check on the equipment in place and on its proper operation and cleaning and also deliver continuous training for hatchery operators. Our joint objective is to ensure the highest hatchery vaccination quality for all birds before being sent to the farms. With a global team of over 175 hatchery specialists who work with hatchery managers to continuously track performance of the vaccination process, specific key indicators are monitored during every visit to ensure continuous improvement of results. 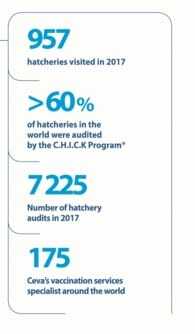 Since its launch in 2009, the C.H.I.C.K Program® hatchery vaccination service has been implemented in hundreds of hatcheries around the world guided by a dedicated team of specialized professionals. They are centrally supported and work in network to ensure the same level of services from one country to another thanks to the application of a set of standard procedures (SOP’s) and innovative tools for hatchery audit and monitoring. Back to "Vaccination services and equipments"